FAST, EFFICENT, BALANCED AND DESIGNED TO WIN (THE IDITAROD)! The bike that Jeff Oatley, Heather Best, and John Lackey propelled to overwhelming record setting victories in the Alaskan Iditarod Trail Invitational, the granddaddy of all winter endurance races, The Corvus is an instant classic. Utilizing the greatest testing ground in the world (our back yard "Alaska"), the Corvus is optimized for stability and speed. Whether it's a two hour rip on single track, or a week long fatpacking adventure, the Corvus will handle it with ease. 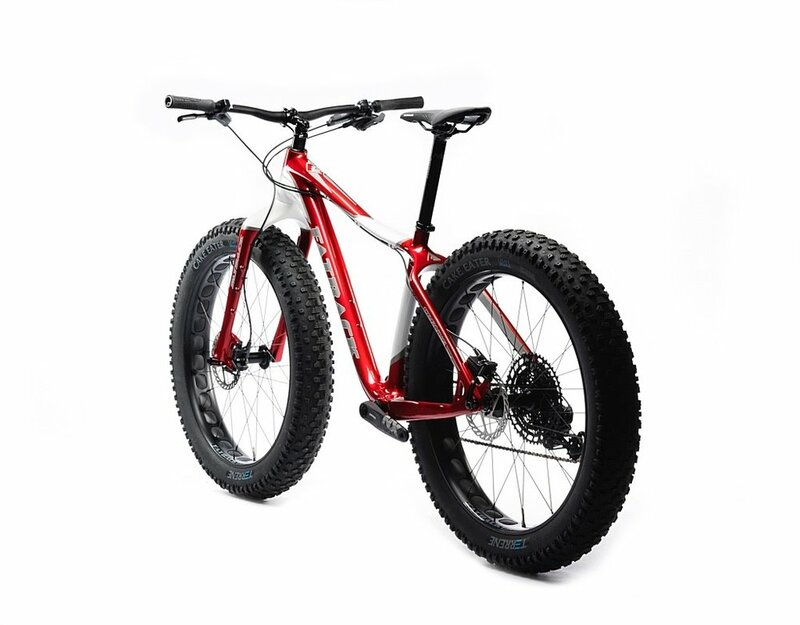 The all new Corvus represents 10 years of Fatbike development by Fatback Bikes of Alaska, culminating in the most refined carbon fatbike available anywhere. Years of prototyping in extreme conditions guided design. While many companies dove into the frenzy just a few years ago and try to dazzle consumers with claims of the lightest, fastest, premier, best, etc...Fatback advances our lead in the industry with real world improvements and innovations such as suspension corrected geometry for those who run suspension, while still maintaining a massive front triangle for frame bags, and providing a great standover height. The all new carbon fork includes Anything cage mounts, uses a 150mm x 15mm hub and offers incredibly precise steering. The chainstays have been shortened further to 450mm, making climbing easier, but still keeping the front wheel properly weighted. Of course, rack mounts are standard, why wouldn't they be? And three bottle cages are standard as usual (on sizes 16" and up). In their latest reviews, FAT-BIKE.com gave the new 2017 Fatback Corvus a 5 out of 5 star rating ! Find out why Fatback has dominated the winter ultra scene for a decade! Give us a call today to set up a test ride ! PLUS+ OPTION WHEELSET : (no charge) STANS BARON S1 27.5 x 38mm alloy wheelset with SCHWALBE Rocket Ron 27.5 x 3.0 EVO Snakeskin tires, and FATBACK Alaska Edition hubs. NOTE : The 2019 CORVUS framesets now have INTERNAL dropper post cable routing, and 2018 colourways are EXT routing only. NOTE : our RIDEFATBIKES.ca "stock" build kits may include a few upgrades, over the stock items posted on the FATBACK website, like for instance, we provide a free upgrade from the Terrene Cake Eaters to the Schwalbe Addix Jumbo Jim tires on the premium CORVUS GX/XO/XT builds. STOCK BUILD KIT WEIGHT is not the total bike weight - It only includes the components on the above list, and is an aggregate of actual items weighed on a park tools ds-2 digital scale. To get complete BUILD WEIGHT, you need to have a fully built bike, MINUS the pedals and sealant. (Add FRAME, tubeless tape, valve stems, misc cabling or housing, frame hardware, frame protectors, etc.) This is commonly referred to as "Manufacturer's claimed weight", and applies to any brand of bike.